The World in 2018, published annually by The Economist, features copywriting and content work that Luminescence has produced for both Samsung and Android. The World in 2018 is a much-anticipated periodical in print and online, which highlights the key global themes to watch in the coming year, drawing on analysis from The Economist correspondents and its access to high-profile thinkers in international politics, business and culture. In total, Luminescence produced content spanning seven pages in this year’s highly anticipated ‘The World In’ magazine. Commissioned by The Economist for Android, Luminescence produced an introductory article about the role Android’s free and adaptable operating system has played in Europe’s digital transformation. This was followed by a timeline charting the milestones of both Android and of internet-enabled technological advancement across Europe, from mobile device penetration to policy, and from app-based social ventures to mobile game crazes that boosted whole economies (Angry Birds, anyone?). Check out the interactive timeline Luminescence worked on, here. View ‘Eight things you didn’t know about Android in Europe’ here, which Luminescence worked on. View the Openness in Europe content hub, produced by The Economist journalists, here. 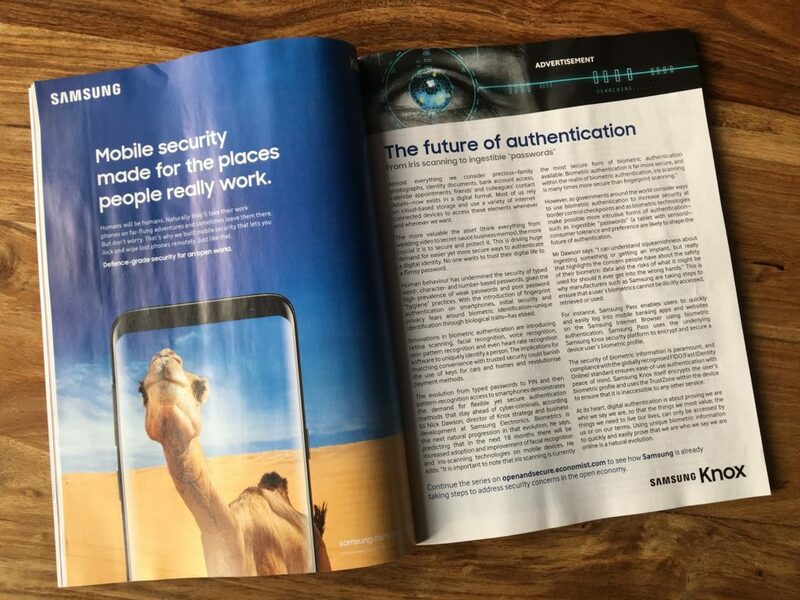 Building on its Open & Secure campaign with The Economist, Luminescence has produced a range of multi-media articles for Samsung Knox – easy-to-manage, defence-grade security for the mobile world. Read about our involvement in this campaign and access the content hub, here. Luminescence has worked with The Economist and its research arm, the Economist Intelligence Unit, since launch in 2012. This year alone, we have worked with The Economist on content projects including producing infographics, articles, e-marketing content, research and corporate copy writing. Thematically, Luminescence has built a sterling reputation in the fields of innovation, technology and impact investing. “We have long enjoyed a strong and collaborative relationship with The Economist and it is always thrilling to see content projects we have worked on come to fruition. “This is the first time our work has featured in The Economist’s annual ‘The World In 2018’ periodical, which is extra special given its large international readership – a publication that really sets the scene for the year ahead. Find out more about how Luminescence approaches Content Marketing and our content pedigree, click here.